Keep track of the GAW PayCoin price in dollars from the convenience of your homescreen. A challenging journey through a beautiful land- with surprises! Side scrolling Ninja action. What more could you want? Interesting concept and excellent delivery! Arrange the tiles in the correct order as the gradient dictates. Surprisingly addictive. An enjoyable retro adventure game. Good sounds. Good Graphics. Avoid the rocks or shoot them. Easy controls and great graphics! A beautiful game of survival! I'm not very good at it as my score was only 278, but I'm sure you'll do better- if you're not chicken! Hahahahahaha! Easy to play. It reminds me of the that episode of Quantum Leap where Sam was a pool legend and the laser showed where the ball was going. Fun! Ok this game is horrendously difficult to start but it quickly gets er horrendously addictive. Try to keep your cyclist from getting and 'x' on impact. This dude is going to get an 'x' on his knee. It's too late for him to turn back. An action SLASH puzzle game. The zombies may not be smart but they are persistent. It's happening now on www.INTPComplex.com. 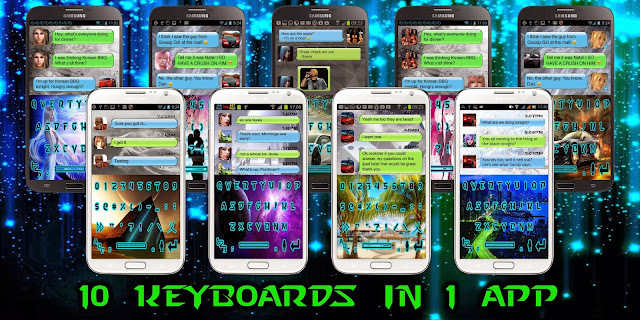 ✧ 10 Incredible Keyboards in 1 App!! This App even works for Tablets! !